K~I know that when you code you have to use specific directions to make the robot do what you want. But robots are not the onley thing to code, there is a large varity of phones and gaming systems that have games to be coded. W ~ I want to know how can I code to make an awesome game and learn how to code with blocks and specific directions and to make a fun game. I want to know how I can make a fun game. H ~ i will do this by playing code.org, taking the class on code.org and I will do a ted ed talk on how I think kids can learn to code and have fun. I will also get my freinds exided to see how the game I make will turn out. L ~ I learned that when you code a bad guy to mover around and get you you can use a repeat option and make it go over and over again. I also learned that it is more fun to code a game and see how awsome it is than to play the game you did not make, because there is no pride in that. i also learned that when you code the directions have to be so specific it sounds stupid but it does good things. I also learned that you have to code the buttons you use like the forward button. And finally I learned that coding can be so much fun!!!!!! Q~ One question I have is how do they make the blocks to block code and is coding used in making websites. also I want to know how will coding get even more commen in kids lifes, like how will schools teach it. I liked this project because it helped me to see some of how games are made. I also wanted to learn how tech stuff is made because the future is ganna be tecky and futuristic. This was so fun because my freinds love it to. this was my favorit project yet. We both know that it has to do with ink blots. Also that you tell about your feelings. We want to know is that what Rorschach psychology? Also, what do kids see in the ink blots. HOW will we find out our Information? We both learned that some people have different types of minds. Some people have a hard time with social interactions, some people are peace makers, and everyone that we tested all had a good sol. We made a padlet wall. We also tested other people. The last thing that we did was make a screen cast. How do you get different colors in it? What types of blots are bad? What I learned was that some people that are mean, have a good sol. I also learned that there is different things. If you see a bat or a moth or a butterfly means a good sol. If you see any other animals, you are a peace maker. I rely liked working on this. I got to explore different things. I liked to show all the different things that I learned. We looked at each picture. Mikey was the only one who got tested because I knew too much. I think that we should test everyone in the class next time to find a average. What I learned is that the resion it is called Rorschach testing is because the man's last name was Rorschach. What was the most fun was to test kids because it was cool to see what people saw in the ink block. I know that some of the most famous codes were Morse Code, java script, and python script. I know that codes are used everyday life by using websites that are coded. I learned that there are many different codes out there and that a lot of things are coded with java or python script. I want to know why some of the famous codes were developed and what they were used for. Also I want to know why people use codes. I will keep researching this topic and adding on to my sight. I want to try to code my own game using code.org and post a video of it. I will do this by researching my topic on the internet and then make a website about my topic. I want to still know more about how coding was first made and about how video games are made. I had a lot of fun doing this project especially when I was creating my website. It was kind of hard to make the website because I had to cut a lot of things that I originally had in mind. If I could do something different with the project I would have better time management. It was very fun to learn about all the different kinds of codes. I think that it will become helpful some time. A lot of things that I learned were really cool, i learned abpotu the origens of Python Script and Morse Code. What Are Some Facts About Creatures That Are Uncommonly Known That I Can Share With The World? • I know that okapi are uncommonly known, and that they are related to giraffes. • I know that there are lots of different animals in the world. • I know lots of people haven't heard of some animals. • I learned that there are many strange animals. • I learned that there are snakes that fly. • I learned about that strange features are often used for survival. • I want to learn what animals are uncommonly known. • I want to learn some facts about those animals. • I have my website for anyone to see. • I have my screencast on Youtube. • I will use the internet to research my essential question. • What are some more types of uncommon creatures? • How do people feel about the way how these creatures look? I really enjoyed being able to do this project because I love animals. It was really interesting to see all the strange animals, and to know why they look so strange. One thing I would have liked to have done was to do many more creatures. I also would have liked a few more facts on the creatures. I enjoyed looking at pictures of these creatures, since they often have strange features. I am glad that I did this project! K: We know that the natural disastrous can kill lots of people and they can wreak places like houses. They can harm lots of things and places. W: We want to know how natural disastrous form and what are comparisons differences. H: We will research and and we will also use our friend Aidan to Help us. L: I Learned how some natural disasters form and what are some similarities and differences. A: I will teach others about my project and help them get interested. 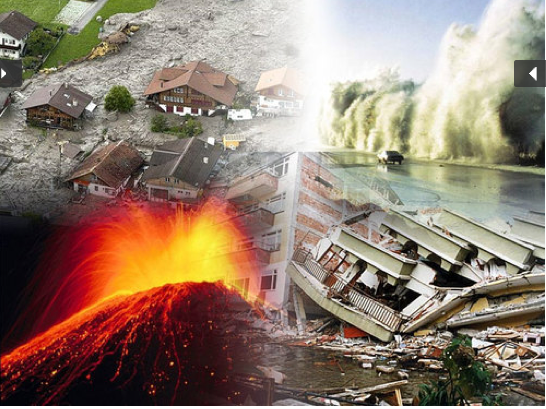 Q: What are some of the deadliest natural disasters from a top 5 list. Nick: One thing I learned is how most natural disasters form and that all of them kill many people a year. One more thing I learned is some similarities and differences between some natural disasters. The most fun thing to do was learning how the natural disasters form and watching videos on them. I think this was fun because it was on the more interesting part of the project. The one thing that was difficult was trying to find similarities and differences. I think this was hard because it was not the most interesting part in the hole project. One thing that was easy to do was getting the facts and learning how they form. I think this was easy because I enjoyed doing this project. Can I learn and teach different genres of music and see what genre kids in Mr Solarz's class prefer? Different genres of music have different styles to them. Some genres of music have a fast beat. Some genres of music have a slower tempo. Some Genres of Music are used for celebrations and other things like that. What do the different genres of music make the listener feel like when listening to music. Which genre is liked most in Mr. Solarz's class. We will research stuff about each genre. We learned that Jazz music was originally invented by African Americans. We learned that pop is a abbreviation of the word "Popular music" Which means pop music is very popular. We learned that most people that play rock use electrical instruments. We will share our information on a website. We will share what we have learned with friends and family. Q- What new questions do I have. Does the type of instrument you use effect the genre of music. I had so much fun doing round five with my partner/friend Stacy. I learned so much about the music I listen to everyday. Some things we learned was we learned a little about eight different genres. 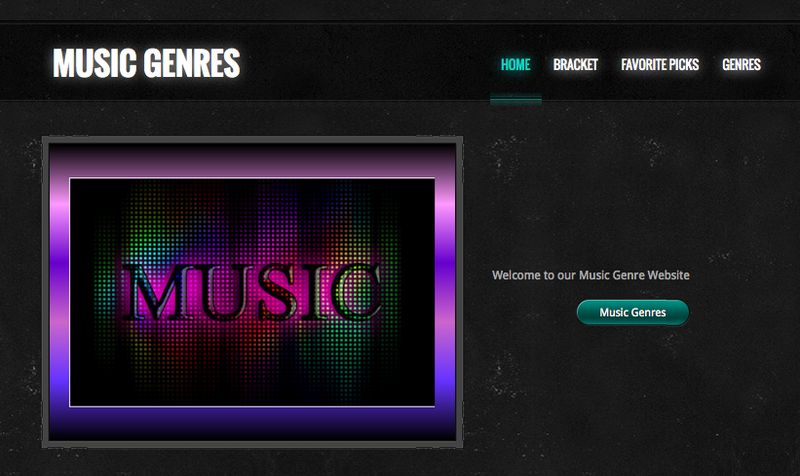 The genres we chose were Jazz, Country, Pop, Rap, Blues, Opera, Rock, Soul. Something I learned about pop is pop is a abbreviation of popular music. I also learned that Jazz, Blues, and Soul were originated by the African Americans and was born in the United States after they were slaves. I had lots of fun learning about music I hope I can Learn more in the future. I had a great time doing round five with Nicole. This round was surely a success. I loved to see that me and my partner had the same interest. I learned that there are many different unique genres of music that have many different histories. I learned that some music genres have abbreviations such as POP which stands for popular and RAP stands for Rebellious African People. A lot of genres have come from the African Americans after they were freed from being slaves and found their glory. I found this passion time project very interesting and fun because I even got to listen music during my researching :) Me and Nicole also wanted to see which genre students in our class preferred so we have a little activity for that as well. 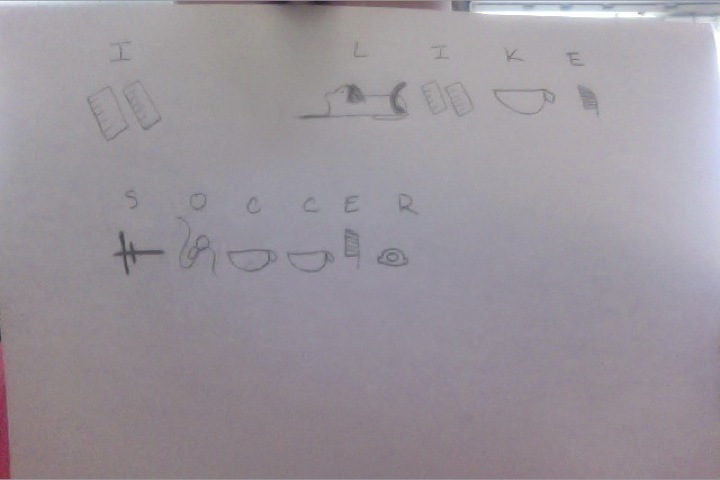 I have learned how to write the sentence "I like soccer." Could I memorize the whole alphabet? Do you think I could learn different cultures hieroglyphics? I had a lot of fun doing this project because it was almost like learning a new language except in writing form! During this project I learned lots of thing like writing a sentence, etc. I have to say the hardest thing was drawing the hieroglyphics because sometimes my lion looked like some sort of dog. So a tip if you ever wanted to do a project like this don't be discouraged if your hieroglyphics don't look perfect and just keep trying. I also learned one of the goals of the hieroglyphics was that the writing would look like art and be beautiful to look at. What Are Some Ways We Can Protect The 5 Endangered Monkeys & Great Apes? By: Emily G.
I know there are many types of endangered animals in the world. Also that everyday they get more and more extinct. I think I learned a lot! I learned the top 5 most endangered great apes and how we could help them! What they eat and were they live! I will take action by first doing my trello and always remembering to publish my website so everyone can see it! I really want to know why people hurt all these animals and if they will soon become extinct? Emily's Reflection - I really enjoyed this project because I feel really bad for these animals and all of them that are extinct not just the great apes! I had the best time learning about them and I learned so much! I had the toughest time trying to come up with this question. It was most enjoyable when I found out all of these facts! I really really had a great time learning about them! K: We know that in the Shark Tank show that the sharks need reasoning for going out and the presenters need to be informed about the product. The products need to help the world in some sort of way. They need to be unique. L: We have learned how to argue persuasively, support products, and decide why you should invest into a product. We also learned about the Products like the Pancake Bot and Hackaball. W: We want to know the different products that people had come up with. We want to know how to argue persuasively. We want to know how to determine to invest in products. A: We will make a fun video with a diffrent product and guest people. 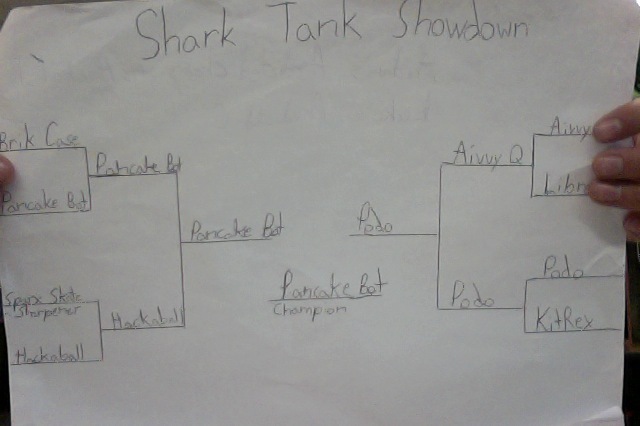 We might make another bracket with different products and mash them together and name it Shark Tank Showdown. Also we will use youtube to record our videos. Also the Youtube video editor to mash our videos together. Q: What happens to companies after they get invested? According to the Sharks is money you make or the how many people have bought your project more important? How does the process of investing in a company work? Aidan's Reflection: This was one of my favorite projects because I have learned how to argue, persuade, and so much about asking why and why not. I really enjoyed working with my partner who was also very passionate about this project. My favorite part was asking him questions and getting to know what the projects he was learning about. The hardest part was to decide who would move on to the next round. This was a very fun project. Luke's Reflection: This was definitely my favorite project. If you just find the right partner and the right question that you both are interested in it could end up like this project. My favorite part was finding facts about the products and learning about them. The hardest part was deciding which product should move on to the next round. Overall I loved this project.